Crystallization is the process of atoms or molecules arranging into a well-defined, rigid crystal lattice in order to minimize their energetic state. The smallest entity of crystal lattice is called a unit cell, which can accept atoms or molecules to grow a macroscopic crystal. During crystallization, atoms and molecules bind together with well-defined angles to form a characteristic crystal shape with smooth surfaces and facets. Although crystallization can occur in nature, crystallization also has a broad industrial application as a separation and purification step in the pharmaceutical and chemical industries. The choice of operating conditions during a crystallization process directly influences important product attributes such as crystal size, crystal shape and purity. By understanding the crystallization process and choosing the right process parameters, it is possible to repeatedly produce crystals of the correct size, shape, and purity while minimizing issues downstream such as long filtration times or inadequate drying. Crystallization touches every aspect of our lives from the foods we eat and the medicines we take, to the fuels we use to power our communities. The majority of agrochemical and pharmaceutical products go through many crystallization steps during their development and manufacture. Key food ingredients, such as lactose and lysine, are manufactured using crystallization and the unwanted crystallization of gas hydrates in deep sea pipelines is a major safety concern for the petrochemical industry. 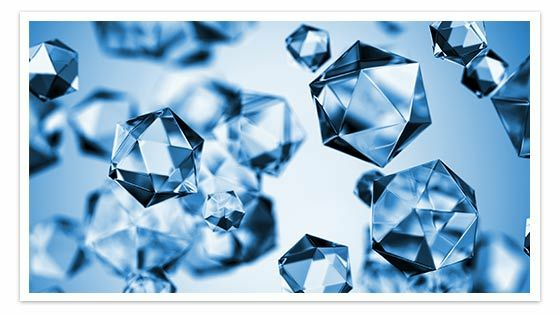 Crystallization is a process whereby solid crystals are formed from another phase, typically a liquid solution or melt. Crystal is a solid particle in which the constituent molecules, atoms, or ions are arranged in some fixed and rigid, repeating three-dimensional pattern or lattice. Precipitation is another word for crystallization but is most often used when crystallization occurs very quickly through a chemical reaction. At a given temperature, there is a maximum amount of solute that can be dissolved in the solvent. At this point the solution is saturated. The quantity of solute dissolved at this point is the solubility. Supersaturation is the difference between the actual solute concentration and the equilibrium solute concentration at a given temperature. The choice of crystallization method depends on the equipment available for crystallization, the objectives of the crystallization process and the solubility and stability of the solute in the chosen solvent. These mechanisms, which are often hidden form scientists, play a dominant role in defining the outcome of a crystallization process. 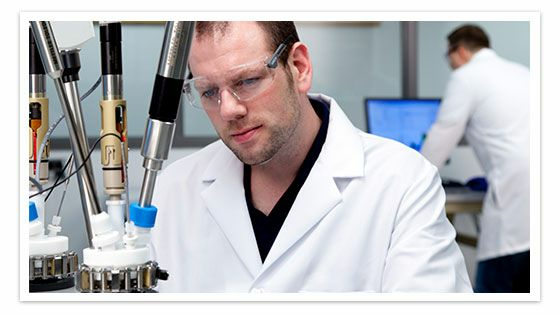 Reduce solubility via cooling, anti-solvent addition, evaporation or reaction. The solution will become supersaturated. Crystallize the product. As solubility is reduced a point is reached where crystals will nucleate and then grow. Highly pure product crystals should form and impurities should remain in solution. Allow the system to reach equilibrium after cooling (or another crystallization method stops). Filter and dry the purified product. Jaroslav Nývlt, Kinetics of nucleation in solutions, Journal of Crystal Growth, Volumes 3–4, 1968. Crystal Growth Kinetics, Material Science and Engineering, Volume 65, Issue 1, July 1984. Kiesow et al., Experimental investigation of oiling out during crystallization process, Journal of Crystal Growth, Volume 310, Issue 18, 2008. Brunsteiner et al., Toward a Molecular Understanding of Crystal Agglomeration, Crystal Growth & Design, 2005, 5 (1), pp 3–16. Fasoli & Conti, Crystal breakage in a mixed suspension crystallizer, Volume 8, Issue8, 1973, Pages 931-946. Paul et al., Organic Crystallization Processes, Powder Technology, Volume 150, Issue 2, 2005. Kitamura, Strategies for Control of Crystallization of Polymorphs, CrystEngComm, 2009,11, 949-964. Crystal size distribution can be optimized and controlled by carefully choosing the correct crystallization conditions and process parameters. 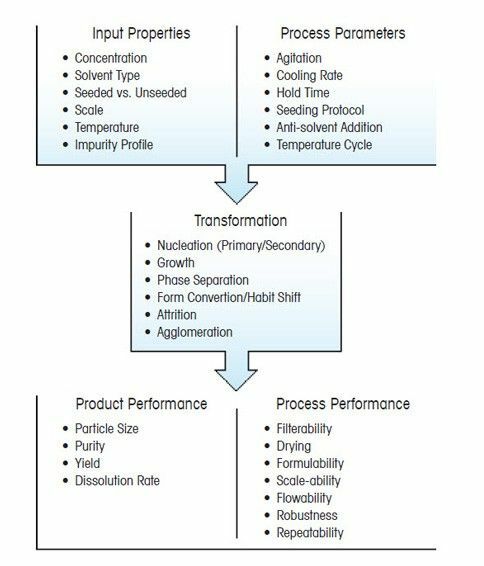 Understanding how process parameters influence key transformations, such as nucleation, growth, and breakage, allow scientists to develop and manufacture crystals that will have the desired attributes and be efficient to bring to the market. In this example, the cooling rate at the end of the batch induces secondary nucleation (monitored by ParticleTrack with FBRM technology) resulting in the formation of many fine particles - directly observed in real time using ParticleView with PVM technology. An increase in cooling rate generates supersaturation faster – which is consumed by nucleation rather than growth. Careful control of cooling rate is critical to ensure the desired crystal size distribution specification can be achieved. The crystal size distribution of ice plays a vital role in the taste and consistency of ice cream, with crystals smaller than 50 μm being better than crystals larger than 100 μm. For agrochemicals, it is vital to ensure that particles are small enough to be sprayed without blocking nozzles while large enough not to drift into neighboring fields. 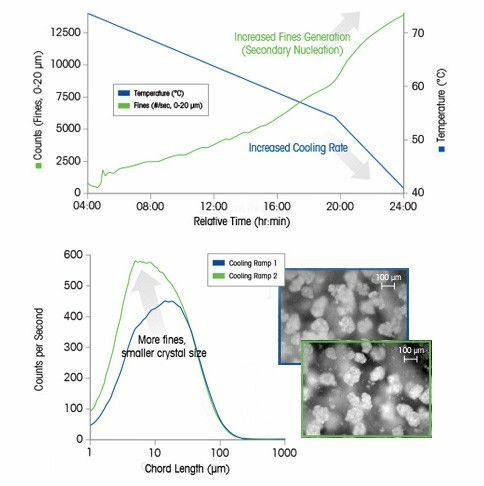 While it is often a challenge to control crystal size distribution across scales, an opportunity exists to understand crystallization processes to deliver an optimized size and shape distribution that will ensure a cost effective process with the highest possible quality.